For the ultimate sleek, uninterrupted streamlined flow in your kitchen we recommend the ultra-modern J-pull handleless kitchen doors. These doors have a J-shaped groove that is subtly integrated into the design so that you can curve your fingers round the top edge of the door and open with a gentle pull. This unique design means you don’t touch the door, so the glossy surface remains smudge-free and remains cleaner for longer. 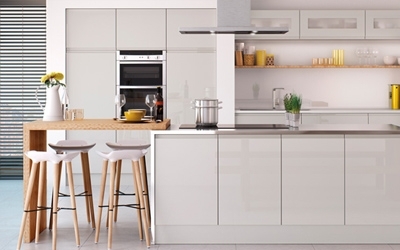 All the handleless doors in this range are compatible with and manufactured to fit other kitchen carcasses from major UK suppliers, including Magnet, B&Q and Homebase. The only difference with cabinet doors from Hot Doors is the cost – at a fraction of the price, you can get the same quality doors delivered straight to your kitchen. There are 22 different colours and designs to choose from the handleless range, so you can create the perfect ambience for your kitchen. From elegant and sophisticated to friendly and open; from modish and modern to family and spacious. You can combine light colours or contrast them with dark tones, and have straight edges that curve with rounded doors - the choices are plentiful and available to you.